It’s tough to dress for the holiday on Valentine’s Day. You probably feel a little goofy going all-out with the red and pink clothes. This is a simple, sweet way to show off your Valentine’s Day spirit. Bonus: It’s easy, fast, and kid-friendly. The easiest way to cut out lots and lots of hearts is to fold a strip of felt down the middle and cut half-heart shapes along the fold. Keep cutting until you have roughly 10 hearts. Yeah, the ones below are different sizes. It’s easy to trim them down later. Stop hassling me. Thread a large embroidery needle with a generous length of embroidery floss. 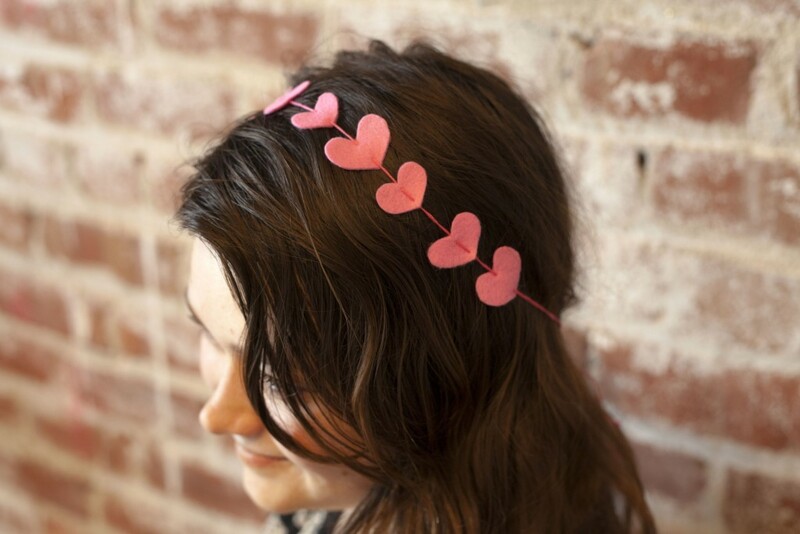 Note: If you’re prefer, you could also use a hot glue gun and add the hearts to a strip of ribbon. You do you. Poke the needle down through the tip of the heart and then back up in the crease. Continue doing this for about 5 hearts worth. More if you’re feeling especially heart-y. Now that you’ve reached the middle of the headband, switch the directions in which you thread the hearts. This isn’t necessary, but it will keep the hearts pointing up on both sides of your head. Step 3: Measure, Knot, Wear. Slide the hearts around on the floss until you’ve got them roughly in the middle of the thread and evenly spaced. Then measure the floss around your head and knot the two loose ends together. Wear proudly. Heartily. And maybe add a couple of bobby pins because it does tend to slide around a bit. Love this – looking forward to sewing some up with my kids Sewing Club! Thanks! You are a blessing. Thank you! !